It's blueberry season. Glorious, juicy, sweet blueberry season. If you're looking for one fabulous blueberry treat this summer, then you've got to make my Mom's Blueberry Sweet Rolls. She has been making them since I was a little girl, and my love for them has never waned. Each bun has warm, juicy, cinnamon-sugar coated blueberries tucked inside of a pillowy soft sweet dough that is glazed with vanilla icing. There is something ambrosial about these buns: they're delicate and pretty enough for a ladies' summer tea party yet homey and comfy enough for a midday snack with a glass of milk. 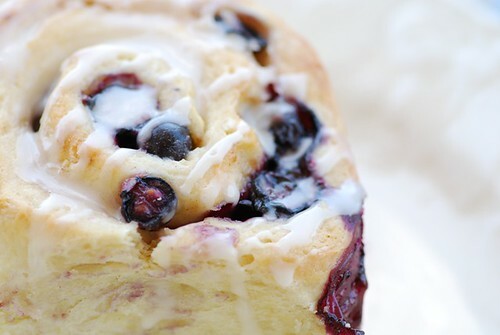 So next time you go blueberry picking, save a pint of your best berries for Mom's Blueberry Sweet Rolls. Trust me, summer never tasted so good. Retraction: Please note that the original posting said that the dough could either be mixed by hand or processed. The dough should be hand mixed only. Mom's Blueberry Sweet Rolls are easy to make, but plan ahead since the dough has to be refrigerated overnight. 1. Mix all of the dough ingredients in a large bowl, and knead lightly by hand until the dough comes together. Roll into a ball, wrap in plastic wrap, and refrigerate overnight. 2. In the morning, the dough will be hard. Let it rest on the counter until it's just cool or at room temperature. Roll it out into a large rectangle. Brush with 1 tablespoon melted butter. 3. Place rack in center of oven and preheat to 350 degrees F. Butter or coat with cooking spray an 8-inch square pan. 4. In a medium bowl, mix the blueberries, granulated sugar, flour, and cinnamon, until well coated, and spread evenly over the dough. Lightly press the berries with your hand so they stick into the dough. Starting with the long side closest to you, begin rolling the dough as tightly as you can, tucking in any stray blueberries as you go. Place the end seam side down, and tuck the ends of the roll under so the berries don't escape. Place the roll in refrigerator for 5 minutes to make slicing easier. Using a sharp knife, cut the roll into 9 equal size pieces. 5. Place the rolls in a prepared 8-inch square dish. Cover with a clean dish towel, and allow to rest on the counter top for 45-60 minutes, until risen and puffy. Bake for 40-45 minutes, or until the tops are golden and a toothpick inserted into the center of the dough comes out clean. Place pan on a rack, and cool. 6. To make the icing, whisk confectioner's sugar, vanilla, and milk until smooth, but not too thin-- it should cling nicely to the back of a spoon. Once the buns are cooled, pull them apart (it helps to run a blunt knife between the buns first). Place buns on a wire rack with a sheet of parchment paper underneath it. Drizzle with icing, and rest for about 1 hour, or until the icing has hardened. Serve at room temperature. P.S. Congratulations to The Mama, aka Heather for winning the grilling kit from Fire and Flavor! Oh my god these look absolutely divine! Thank you for sharing! That is such a wonderful idea! I never would have thought of adding blueberries. I have 2 tubs of blueberries so I might give these a try if I have time to play around with yeast. Never seen anyone do this with blueberries. Genius! Oh no. I've been obsessed lately with trying every incarnation of homemade cinnamon rolls and now blueberry rolls? They look just too good to pass up! Oh my, these rolls are calling my name- they look awsome, Susan! I have a list of blueberry recipes to try, so I'd better get busy. I'm adding these lucious rolls to the list! What a gorgeous celebration of summer, Susan! I am in love with blueberries, and smitten with this recipe. I think I could easily gain a sweet roll around my middle by eating an entire batch of these sweet rolls! But so worth it. How come Ive never heard of these before??? They sound AMAZING! I will be bookmarking this one to make for sure! I woke up this morning thinking about cinnamon rolls, but now I'm going to be thinking about these blueberry rolls! This looks wonderful, I have a question about the dough, is it 1 cup of butter, melted (2 sticks melted and that's it) or is it melted butter that is then measured in a liquid measuring cup? I want to make those for the long wekend, the look sooo yumy! with something looking as beautiful as this, love for it can never wane! gorgeous. those sweet rolls are incredible! I love the addition of blueberries, but then don't they make just about anything taste better? Thanks for the shout-out on my Blueberry Crumb Cake post! Susan these look absolutely amazing!! Never would have thought to combine blueberries and cinnamon rolls but I can't wait to give it a try! Oh Susan, you've done it again. What a fantastic idea for a roll...never would have thought to do that. They look delicious! What a fabulous idea. Blueberries are something I've enjoyed more fresh than baked unless in a muffin. These sound wonderful. I fell in love with these when I saw the post in my reader. WOW. For the nth time in my life, I wish we got blueberries here.I'm literally stuck to the screen Susan!! Oh these look gorgeous Susan! I have got to find some fresh blueberries! a doubt how much is 2 packets of yeast? can you pls let me know in tsp of grams? I don't think I've ever seen blueberry sweet rolls...they always seem to be cinnamon. those look fantastic!!! Oh gosh! These are even better than cinnamon rolls. And much prettier too! Perfect for a brunch with friends :) Bookmarked! Wow, your blueberries rolls loos absolutely fantastic...could not look yummier! And you are right, why not use blueberries while in season? Love the pictures. OMG!!!!!! I will def be making these with fresh blueberries! Or should I just use frozen?...decisions, decisions....I love these rolls Susan! SUSAN. You are SO talking my language right now. I have SO many frozen blueberries from my dad's garden that it's ridiculous. I know what I'm making this weekend. now this is my sort of yeast baking - you are truly a temptress! I was just thinking about making cinnamon rolls today but now you've convinced me I must make these! They look gorgeous. I can't wait to get my hands on some local blueberries. steph-They pair perfectly with the sweet dough. deborah-They are worth day dreaming over! patsy-Oh, you're quite welcome, my dear! mark-Dizzy, huh? I'll take that as a good sign. nicole-You aren't going to be disappointed. The flavors are divine! kristen-That's my mom for you-- always thinking of terrific baking ideas! kellypea-I'm so happy you like them! aparna-Did you? I have been away for a few days, so I'll have to check it out! deeba-Whaaat? You don't get blueberries?! That warrants a trip to The States then! parita- Oh, sure. One packet of yeast is 7g or 1/4oz, so 2 packets is 14g or 1/2 oz. danielle-They're so amazing, especially in the summertime. wanm-Perfect indeed! Thank you so much! juliana-Oh, thank you. I enjoyed taking them too. johanna-A temptress, huh? I like that! ashley-That's right. Move on over, cinnamon rolls, cause blueberry rolls are in town! abby-Yay! I'm so happy to hear that! You're certainly right - please add lots of the glaze! These are gorgeous. Hubby is obsessed with blueberries and I am sure we will love this! I love cinnamon rolls and pity we can't get any blueberries in Greece. These sound amazing. What a brilliant idea!! I think I'll use my regular cinnamon bun dough, but using blueberries (or bilberries, which grow wild here) instead of cinnamon. Mom's the best! Those rolls look so beautiful. Thanks for sharing, Susan. veron-Then he'll love these, I promise! sha-I'm surprised at how many people can't find blueberries where they are. And I didn't think sweet rolls could get any better. I will definitely be trying these. Oh my!!!! BLUEBERRY ROLLS?!?! You have just won my heart! These look and sound AMAZING!!!! Oh my goodness. 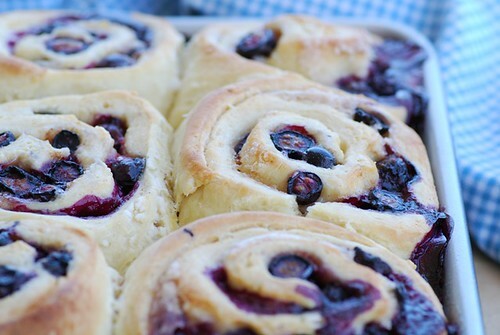 Blueberry Sweet Rolls sound divine! I love sweet rolls and love blueberries, so that sounds like an amazing combination. Can't wait to try them! The lighting of the photographs makes these even more heavenly! Once in a coffee shop I has this blueberry cake and I fell in love with the wonderful taste of blueberries. Anyway, I plan to make these rolls ASAP. I love the addition of blueberries, and I have some sitting in my freezer right now. jennifer-Yay! I'm so happy you love them! sarah-Hope you enjoy them! Thanks. lone acorn-They're easy to fall in love with. memoria-Yup, the preheating comes the next morning. Thanks. Hope you enjoy! Hi Susan, I made these blueberry rolls for my 4th of July breakfast, and they were awesome! My kids gobbled them up and want to know when I'll be making more! Thanks for a great recipe. Mary from Maine. Those look and sound SO good! Funny you posted this. The other week I was thinking, why make cinnamon rolls? Why not add fruit instead, like a danish? Just saw these on blogher, and now I have to try them! These look insanely good. Mmm, I love blueberries! I linked to this on my weekly roundup, post is here. Thanks! I've always been terrified to attempt yeast breads, but you've inspired me! I've never seen a more delicious looking sweet roll. I made these and blogged about them at http://marzipanmom.blogspot.com/2009/07/blueberry-cinnamon-rolls.html. They were wonderful!! Try them with a drizzle of cream cheese icing...oh my! Susan-these are fabulous! I can't wait to make them. I just found this website and these rolls look divine! I want to make this for a bigger gathering. Can I just double or triple this recipe? melissa-I haven't done it before, so I don't know for sure how it would turn out. My inclination would to do separate batters. I find working with a really large amount of dough to be tricky. Hope you enjoy them! I made your recipe and the wonderful result! I'm in KW's most viewed stories of 2009, twice. "This Mac n' Cheese Tastes Like Doritos." Healthy Muffins That Taste Good. Really. Do You Tofu? I Do. Muffin Tops: Flat or Pointy? What Threat? I Made You a Ricotta Pie. Thanks, Tony Romo, For Buying My Book! The Derm Blog. Smarter Skin Care. Yes, he's my husband, but he's also a great dermatologist. Check out his blog to see for yourself.